SV - What made you start Pole Classes? YL - I’m the type to do a LOT of research before I throw myself into something new. I knew I wanted to try pole dancing, and I knew I would be able to build on my background as a gymnast and acrobat. Out of all the studios in Sydney, Studio Verve really stood out as the right place for me, from the very beginning. Their web site is inviting. It shows students having fun and being part of a community, unlike some websites that show serious-looking individual performers in high heels and tiny shorts. Don’t get me wrong - there’s a definite place for that style of pole dancing, but that’s just not for me. Studio Verve appealed to me as a fitness activity rather than just for learning exciting tricks. I figured that having a Director (Jen) with an extensive ballet and dance background, would translate into a studio that focused on technique, precision and love of dance. I’ve adored it since the moment I first stepped through the doors! SV - How does PoleFit® make you feel about yourself? YL - I feel fit, like more of an athlete again, something I hadn’t experienced in many years despite regular pilates and yoga classes. I find my confidence has improved, and my friends and family keep commenting that I look really healthy and toned. I feel strong - many ask if I lift weights or have a boot camp fitness regime, but in pole we really just lift our own body weight! I feel like I have been welcomed into a loving and supportive family. SV - How long do you see yourself pole dancing for? YL - At least until I’m 64 like Greta Pontarelli! Well at least as long as I’m still being challenged and enjoying myself, and the sky's the limit with pole. There’s always something exciting and interesting to learn, or a new variation on a more basic move. I am addicted to YouTube pole dancing videos now, and each routine I watch provides further motivation to continue learning. SV - What keeps bringing you back to Studio Verve®? YL - Definitely the culture. Studio Verve is warm, inviting, inclusive, challenging and most importantly a fun place to be. All of the instructors are absolute professionals, and are devoted to making the classes as safe and appropriate as possible, while still offering alternatives or challenges if we want to take moves a little further. I love that we have daily access to the studio to practice what we’ve learned in class, and to play with our own combinations and transitions. My fellow dancers are such a beautiful group of people, creating an inspiring, supportive and healthy environment. You will never find even a hint of competition at Studio Verve - everyone is out to help and encourage their pole family, and celebrate every success, no matter how small. 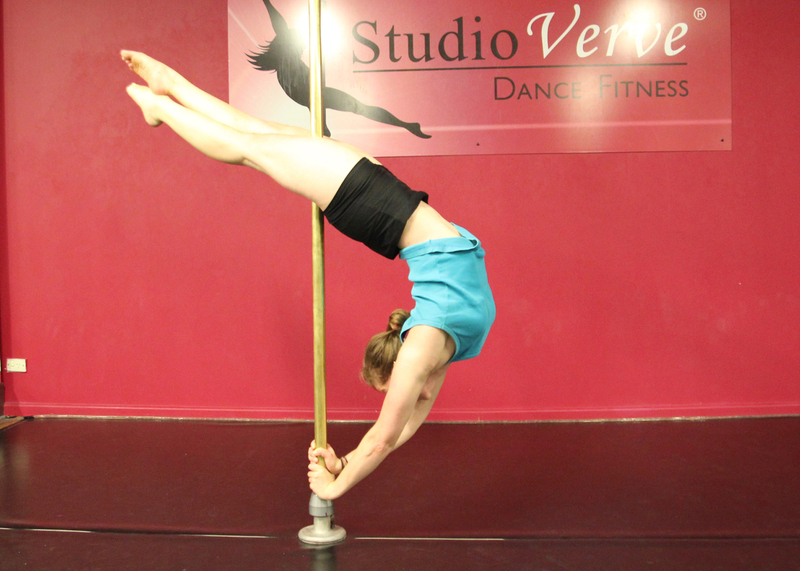 SV - What is your 2015 pole goal? YL - To become less of a gymnast! I am working on making my moves less mechanical, having smoother transitions and a better flow to my combinations. My biggest challenge is letting my body find its natural movement rather than methodically hitting position after position. It’s definitely a work in progress, and I’m having a wonderful time regardless!